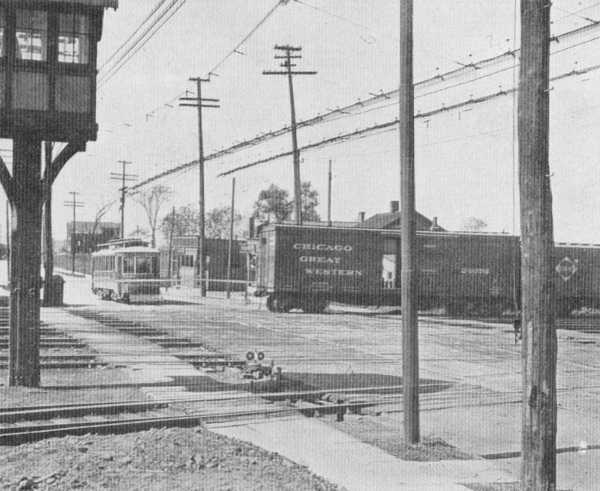 By ROBERT HOFFMANN, C. E.
Existing Grade Crossing at Union Ave. and Pennsylvania R.R. this enormous growth of railway traffic and the rapid increase of the city's population have been foreseen, the relative grades of streets and tracks would, no doubt, have been so established as to prevent nearly all grade crossings; but, as railroad building has been the development of a growth peculiar in itself, considered both financially and scientifically, we must accept the so-called grade crossing problem as one of today, and not lay any blame upon our predecessors on account of lack of foresight. The railroad crossing at grade of streets should be abolished seems well established and projects to that effect are being undertaken in nearly every important city in the country. That locally there is a demand for grade eliminations was shown by the recent vote in favor of issuing two million dollars worth of bonds to enable the city to continue in its work in that respect. The strongest argument in favor of abolishing railway grade crossing in cities is, of course, the possibility of removing the great danger to life which their presence causes. In spite of all the safety devices and precautions adopted in recent years, every now and then a serious accident takes place, causing a loss of life, which the separation of grades might have prevented. No other argument ought to be needed, as it seems a basic principle, that city streets should, with reasonable care, be safe to use and not present any condition forming a menace to life. Secondarily, the elimination of grade crossings is desirable for reasons of economy. Calculations bases on time lost by passing trains holding back street traffic can show results of enormous amounts. It is questionable to just what extent the saving in time in this regard could be realized on--that there must be some economy, however, is quite evident. Even without any direct financial return, the possibility of street traffic being allowed to continue without friction and irksome delays, makes in itself a strong argument in favor of eliminating railway grade crossings. Where no grade crossings are encountered, there must also be a great saving in expense to the railway companies, for the reason that they are able to dispense with safety gates, guards and the slowing down of trains. Whether the saving due to the last mentioned item is a net saving or not, depends upon the amount which the railway company must invest in order to make such saving possible. There can be no doubt, however, that in addition to the horror of taking life, the liability for the payment of damages--due to accidents--must appeal to the railway companies as an argument sufficient in itself to make separations of railway and street grades desirable and necessary. Eliminated Grade Crossing at Broadway and Pennsylvania R. R.
Clark Ave. and C., C., C. & St. L. Ry., Showing How Grade Crossing was Eliminated. made possible the growth of the other. The evil of grade crossings is a matter which neither the municipality nor the railway companies could have foreseen, being the result of the gradual growth of conditions, to the existence of which both have contributed. It seems only just, therefore, that both should pay a proper proportion of the expense, which will vary depending upon the benefits derived. Should, for instance, the railway company, under a grade elimination agreement, be allowed extra concessions, such as additional tracks, additional right of way, or have made possible a change in grade of alignment of special value to the company, it seems only right that the railway company should pay accordingly. On the other hand, should no special advantage accrue, an equal division of the cost would seem more just. When abolishing existing railway grade crossings, it seems eminently proper that the municipality should, in any event, pay something towards such cost, the amount depending somewhat upon local conditions, and upon state law requirements, but probably this amount should never be over 50 per cent. Another conclusion which can be drawn, with equal force, is, that whenever new railways are built, they should either be so located that no grade crossings are established, or, should crossings be permitted, the municipality ought to have the power to order their elimination at the expense of the railway company as soon as traffic conditions make the same desirable. 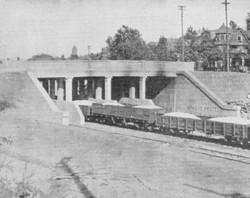 History of Local Developments in Grade Separation. Locally, grade crossing elimination work began about 14 years ago, when East 55th street, then called Willson avenue, was elevated and carried over the tracks of the N. Y. C. & St. L. Ry. This crossing had long been looked upon as a dangerous one, the railway tracks crossing at the foot of a steep approach, and being further complicated by an existing street railway track. In making this improvement, the railway company built the south approach and the portion of the bridge over the railway tracks, while the city built the rest, including the north approach. An amount of ten thousand dollars was contributed by the street railway company. This is the only case in the city where a street railway company has made any direct contribution towards the expense of eliminating a railway grade crossing. 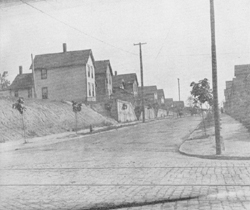 Pennsylvania crossing at Broadway, East 93rd street, Warner road, Harvard avenue, Seager avenue and Kinsman road. Erie railroad at East 55th street. 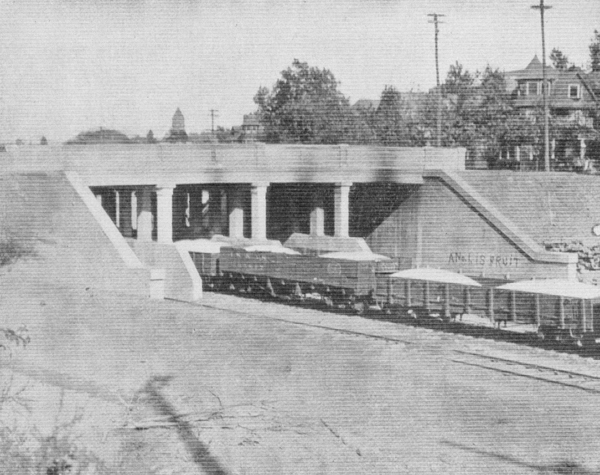 L. S. & M. S. R. R. at Detroit avenue. 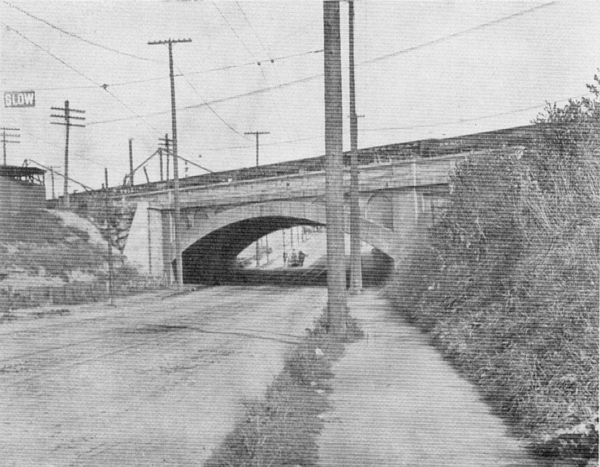 Kinsman Road Bridge Over Pennsylvania R. R., Showing How Grade Crossing was Eliminated. N. Y. C. & St. L. Ry. N. Y. C. & St. L. Ry. at Detroit avenue, West 98th street and West 96th street. B. & O. R. R. at Clark avenue. 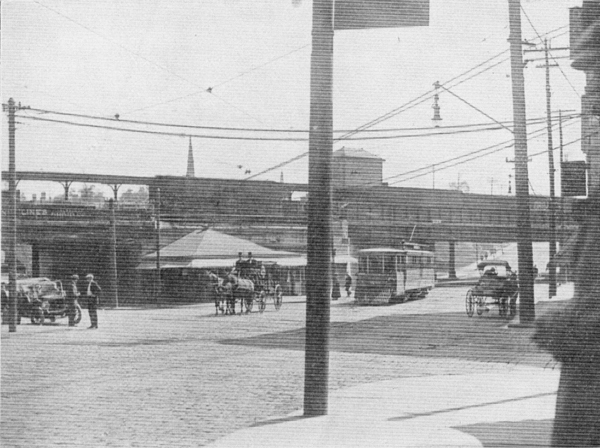 C., C., C. & St. L. R. R. at Clark avenue. W. & L. E. R. R. at Jefferson avenue and Harvard avenue. At present, there are in course of elimination, along the line of the N. Y. C. & St. L. R. R., crossings at Euclid avenue, Mayfield road, Cornell road, Adelbert road, Woodhill road, East 105th street, Quincy avenue and West 25th street. Incidental to these last crossing elimination, existing railway bridges across Cedar avenue, East Boulevard and Fairmount road, are being rebuilt to suit the changed grade of the railway tracks. 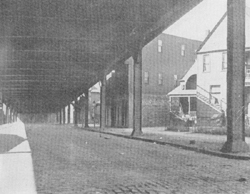 With the exception of West 25th street, the crossings now being taken care of along the N. Y. C. & St. L. R. R. are being abolished at the expense of the railway company alone, the company having paid into the city treasury the proportion required by law for the city to assume. The railway company obtained, through a condition of the grade elimination legislation, grants to lay two additional tracks across the street mentioned, which, no doubt, compensated it for the extra cost assumed. Many more railway grade crossings in Cleveland are still to be eliminated. Those where the highway is used for street railway traffic must be considered the most dangerous, and consequently the most urgent for early treatment. As in many cases, the railway grade must be raised or depressed, as well as the highway grade changed, it is often not practical to abolish one crossing at a time, but requires the consideration of a group of streets. 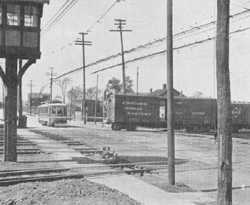 This is the reason, as all engineers will readily appreciate, why certain grade crossings generally acknowledged as the most desirable to eliminate, such as Euclid avenue and Lorain avenue, have not been provided for heretofore. In order to raise the Pennsylvania tracks 17 feet, as contemplated at Euclid avenue, it will be necessary to begin the approach grade from the north in the vicinity of St. Clair avenue, and from the south at Central avenue. To do otherwise would introduce an approach grade far steeper than the railway traffic could be expected to operate upon, and would also temporarily bring the track grade at the neighboring streets at an elevation lower than the ultimate one, necessitating thereby temporary bridges and unfinished approach grades. Temporary work of this kind is always undesirable, as improvements cannot be made to fit the finished street grade and the interruption to traffic, due to construction work, must take place a second time when raising the tracks to their final elevation. Similarly at Lorain avenue, some ten or twelve of the neighboring streets must be taken into consideration, should the railway tracks be lowered as planned, so that the crossings may be reasonably provided for, and that the railway may be properly operated. Along the L. S. & M. S. R. R., thirteen. Cedar Ave. and N. Y. C. & St. L. Ry. 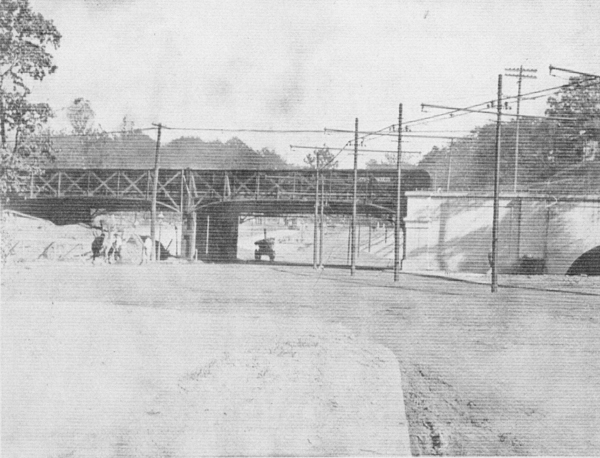 Bridge Under Construction. West Twenty-Fifth Street and N. Y. C. & St. L. Ry. Retaining Walls for Approach Under Construction Along Property Line. Along the Erie R. R., seventeen. Along the N. Y. C. & St. L. R. R., forty-two. Along the C., C., C. & St. L. R. R., twelve. Along the B. & O. R. R., eight. Along the W. & L. E. R. R., twenty-three. Along the Newburgh & South Shore R. R., two, making a total of 146. Some of these do not demand immediate attention and some can possibly be so combined that one crossing may answer for two of three of the streets. At 26 of these crossings, there are street railway tracks, and they are, therefore, the most important and ought to receive the first consideration, but, as stated, they involve the treatment of neighboring crossings, so that at least as many more must be abolished in order to provide for those at street railway tracks. Just in what order the remaining work will progress cannot be finally established at this time, as it depends largely upon the co-operation of the railway companies and the speed with which the agreements relating to the work can be obtained by the city. The bond issue of $2,000,000, recently voted upon, is to provide money for certain crossings only, as stipulated in a council resolution, and will probably be sufficient to pay the city's portion of those crossings most necessary to abolish. Should the railway companies refuse to co-operate, or should no agreement regarding plans and division of cost be reached, the statute fixes a method of procedure. The grade crossing law provides that municipalities may raise or lower the grade of any street, or may order the raising or lowering of railway tracks in order to separate grade whenever the council or other legal board of legislation may declare the same necessary. Municipalities may also, for such purpose, relocate and vacate streets where such action is declared necessary. The council or board of legislation may order, by ordinance, that railway companies co-operate with the engineer of the municipality and submit plans and specifications within three months, or longer if mutually agreed upon, specifying street grades, railway grades, kinds of structures and method of erecting, also whether supports or abutments are to be located in streets. No change, however, in the railway tracks shall be made that exceeds the ruling grade of the railway. In the event that the railway company fails to co-operate or, in case the plans and agreements are not mutually approved, the municipal corporation may submit the matter to the Court of Common Pleas. An opportunity is then given by the court for either the railway company or the municipality to submit plans for grade elimination. The court may then pass on plans, order changes or refuse plans. The court also has the power to enforce the work. been equally divided by the municipality and the railway company, but being changed, at the last session of the legislature, so that the railway company must now assume 65 per cent of the cost, and the municipality 35 per cent. Provision is also made for the payment of damages to owners of property affected by reason of change in street grades. Power to appropriate land necessary is likewise given. The municipality must pass a resolution or ordinance setting forth its intention to do the work and establish the manner of paying damages. Notice of such intention is served upon property owners supposed to be affected, thus giving them time to file claims for damages as provided for by law. Grades of streets changes must also be re-established and notice of such re-establishing served. Generally the notices regarding the intention to eliminate the grade crossing and change the grade of the streets can be combined in one. The grade crossing law also establishes the clearance of bridges over railway tracks as 21 feet, but provides that by mutual agreement or court order, this clearance can be reduced, but cannot be made less than 16 feet 3 inches. The maintenance of the structure is established, in that the statue provides that railway companies shall maintain all bridges used in carrying the railway over the highway, and the municipality shall maintain all bridges used for carrying the highway over the railway tracks, together with the street approaches. Bonds may be issued to defray the municipality's portion of the cost, but such bonds may not be sold at less than par, and shall not bear interest to exceed 4 per cent. Taxes may be levied to provide for payment of bonds and interest, and also to provide for necessary maintenance and repair. Street railway companies may be made to pay not to exceed one-half of the municipality's share of the cost. In the foregoing, the general history of the railway grade elimination movement in Cleveland has been given, together with an abstract of the law authorizing and providing for the work. What will possibly be of more interest to engineers is a discussion of the engineering questions involved or the structural details and difficulties encountered. However, to enter into this phase of the question at all elaborately would extend this paper far beyond the time allotted to it. things to be considered. Add to these the maintenance of railway traffic, as well as highway traffic, the encountering and relocating of numerous underground improvements, such as sewer, water pipes, gas pipes and electric conduits, the question of drainage and beauty of architecture, and there results a problem to solve, which requires the best ability of both railway and municipal engineers. In making the general plan for grade elimination along the line of any railway, one of the first questions to be considered is, whether the tracks should be raised or lowered. Discussion of this topic is perhaps forced on account of the interest taken by the public. Many citizens fear that either the one treatment or the other may result to their disadvantage, possibly due to smoke, the making of more noise, the possible development of undesired manufacturing property, or, on the other hand, rendering such development impossible. Judging from local experience, it is doubtful whether one could determine which plan is the better. From the railway point of view, there is little opportunity for any general discussion of the question of raising or lowering tracks, it being almost wholly a problem which must be decided in each case, and not a matter of policy. A railway company would naturally adopt that plan, which, all things considered, would prove the most economical, due consideration being given to structural difficulties, drainage, development of business and grade betterments. This might cause either the lowering or raising of the tracks, depending upon the things involved. which can be greatly reduced by reducing the rate of grade and abolishing grade crossings. With the beginning of construction work, the traffic along both the railway and highway becomes involved and presents for solution one of the most troublesome problems of grade crossing eliminations. Provision must be made for both kinds of traffic. The railway company's trains must be kept in operation, carrying passengers and freight, even though the tracks are being raised or lowered. Great credit must be given the railway engineers in so scheming and manipulation their work that traffic may proceed and yet have room and opportunity for using steam shovels, for laying new tracks, providing for drainage and erecting new bridges. This often involves a considerable expense which is not always manifest when making estimated costs for work of this kind. No less important is the consideration of the highway traffic. Imagine the condition, should the sixty or seventy thousand people daily passing over the Pennsylvania tracks at Euclid avenue, be forced to take some other route during the period required to eliminate this crossing. Evidently the work must be done in such manner that traffic on both the railway and highway can be maintained. At the best, the traffic, though not broken, must be subject to interference, business in the vicinity of elimination work may be affected and as a consequence much criticism heaped upon those directing the work with accusations of neglect, slowness and even incompetency. Some of the criticism may be merited, as it is quite natural that the progress of the construction work should appeal more strongly to those in charge than the ease and comfort of the people who wish to pass alongside and over the work while it is in progress. Engineers will appreciate the difficulty of always making work of this kind run smoothly, where, in addition to the work of the contractor and the maintaining of traffic, there must also be considered the property of a street railway company, the pipes of the gas companies, the wires and conduits of two telephone companies and an electric light company, and in many cases the city sewers and water pipes. It seems almost impossible to make the work or the various interest follow logically without annoying delays. Where possible, a considerable outlay is warranted in providing a temporary roadway at some other location, and this has frequently been done. In many cases such a temporary detour is not feasible and the public must needs be patient and realize that the interruption to traffic is necessary and in a good cause. places where the railway bridge carried the tracks over the highway. This was done in order to avoid the excessive depth of girders required in certain long spans, making possible a saving in expense as well as producing a more pleasing appearance by establishing a better relation between depth of girder and the clearance above the roadway; otherwise the roadways have been kept clear, no supports at the center of the roadway having been allowed. 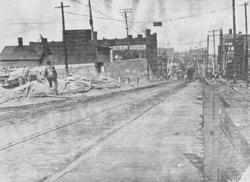 Clearances over highways have been varied from a minimum of 13 feet to 14 feet 6 inches, where existing or proposed street railway tracks made the greater clearance necessary. This clearance has been thought too small by the engineer of maintenance of way of the local street railway company, who claims that 15 feet should be the minimum. The suburban cars would be better accommodated with a 15-foot clearance, as would also some of the construction cars and appliances, used by the street railway company. It is quite probable that this clearance will be increased to 15 feet in the future work. Wherever possible, clearances of highway bridges over railway tracks have been fixed at 21 feet, the maximum required by law, but along the line of the N. Y. C. & St. L. R. R., on account of highway approach complications, the minimum of 16 feet and 3 inches was adopted. The approach grades vary with local conditions and it is endeavored not to introduce heavier grades than those in use in the vicinity of the bridge. In some locations, local grades must be exceeded, but in general, it is attempted to keep within a maximum grade of 4 per cent. In a few cases, 5 per cent grades were used and in two cases 6 per cent, on account of local conditions making a less grade inadvisable. In general, surface improvements on the approaches, such as paving and sidewalks, are relaid with material similar to that existing before the change in grade. The old material is used to some extent, but most of it is new. In cases where the new grade is at a rate of 4 per cent or greater, no matter what material has formerly been used, it has been the custom in repaving to use block stone. It so happens that nearly all of the crossing approaches so far treated in Cleveland, under grade crossing proceedings, are paved with Medina block stone. Nearly all of the bridge abutments and retaining walls in the grade eliminating work have been built of concrete. This material has certainly shown itself to be an economical one and of great adaptability for such use. It can hardly be claimed that the masonry structure so far built in this connection are very beautiful, and they seldom present as pleasing an appearance as is possible with block stone masonry. The unsightly crazing, cracking and discoloring that concrete is subject to has taken place in nearly all cases. It must be conceded, however, that progress is being made in concrete finishing and that some of the more recent work now in progress shows a decided improvement in this respect. 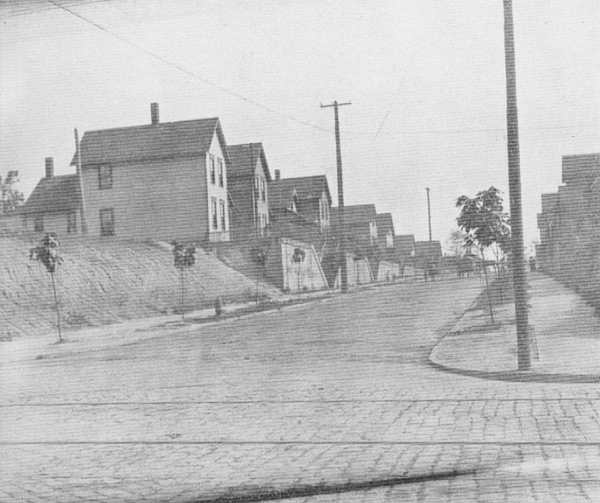 Kinsman Road and Pennsylvania R. R. Bridge Showing Abutting Property Left at Grade of Old Street Now Seldom Used for Traffic. of the N. Y. C. & St. L. Ry., through the eastern portion of the city, than was done to those of most of the other grade elimination structures. Proximity to residence streets and parkways naturally invited such treatment and there seems little reason why it should not always be adopted. It could certainly do no harm and would cost but little more to place sightly structures even in manufacturing districts, where they might possibly tend to develop the aesthetic side of those of us who pass nearly all our days among shops, warehouses and railway tracks. is the adjustment of damage claims. This is because there is so much opportunity for argument, complaints and bickering wholly foreign to an engineer's desire. Locally, less of this work is now cared for in the engineering office of the city than formerly, it having been found more satisfactory to have the law department adjust the claims. It has been found desirable to employ a claim adjuster who devoted all of his time to this phase of the work. From time to time, it is also found necessary to have competent appraisers appointed who pass upon the various cases for which damage is claimed. In nearly every crossing, in which the grades are separated, it becomes necessary to change the grade of the highway. Buildings have probably been constructed on the abutting land or it may have been otherwise improved, all with reference to the grade of the highway, as originally established. Where the level of the street is changed to conform with the plans of the crossing elimination, it frequently leaves the improved property either so much higher or lower than the new grade, as to affect the property value detrimentally. It is to properly adjust any such loss in value that damage claims are considered and adjusted. As mentioned in the paragraph referring to the legal proceedings used in eliminating grade crossing, notices are served upon property owners, calling their attention to the proposed work and to the contemplated change in the grade of the street, affording thereby an opportunity to file a claim for damages should any exist. Damages are usually adjusted after the work is completed, the time of such adjustment being fixed by council resolution, which is referred to in the notice served upon property owners. There is a great opportunity for difference in judgment in fixing the amount of damage which a given piece of property is entitled to, by reason of change of grade. In some cases, nearly the entire value is destroyed, as it may involve a relatively great expense to raise or lower buildings, fill or excavate lots or otherwise readjust matters to suit the new grade. It is a difficult question to approach in a scientific manner, as scarcely two cases are alike. Even if two similar cases arise for adjustment, it would be found that the claimants held different views, so that, in the end, damage adjustment becomes largely a matter of negotiation and arbitration. Several items like loss in business during construction, or loss in value, due to traffic being so diverted that it no longer passes in front of or near a piece of property, are not considered in law as valid claims for damage allowance. There must be a change in grade of the street upon which the property abuts, or else some other direct physical change due to the improvement in order to entitle property to any consideration for damage allowance. claims. Should there be some special benefit by reason of the improvement, it would be allowable to consider it, in fact it indirectly must be, if damages are correctly fixed, as they theoretically should always amount to the difference in value of the property before and after the improvement is made. West Sixty-First Street, Showing How Street was Lowered on Account of Clark Ave. and C., C., C. & St. L. Ry. Grade Elimination. should no agreement be possible, resort is had to the courts and the property appropriated. I am pleased to state that to date only in a few instances has it been necessary to bring suit for the acquiring of land or in settlement of damage claims, and that in each such case the position of the city has been practically sustained. quate. Lack of funds alone can block progress. No issue of bonds for grade crossing elimination purposes has been at all seriously opposed, and as the proposed issue of $2,000,000 was ratified at the recent election by a two-thirds vote, it can be deduced that public sentiment is favorable. With these things in view, it seems in place to attempt making a rough estimate of the cost involved in eliminating all remaining crossings, as the city will, no doubt, be soon called upon to pass upon further expenditures for such purposes. When certain damage claims now pending have been adjusted, the city will have expended for grade crossing purposes about $1,070,000. Add to this an estimated cost of $175,000, as the city's share of abolishing the West 25th street crossing, and there results a total of $1,245,000, paid as the city's portion of the cost of eliminating 16 crossings. This makes an average cost of about $78,200 per crossing. This average cost takes into consideration certain crossings that were abandoned, the streets being connected with others in the vicinity and a combined crossing at the railway tracks provided. Each such street is counted as an eliminated crossing. The work so far done has involved complicated, expensive cases, and also some that were reasonably cheap and simple. The estimate given can, therefore, be used as a fair average. Changing this average cost to suit the rate of 35 per cent, which now represents the city's portion of the cost of grade crossing work, the cost for future work per crossing would be $54,740. This would yield a total sum for the cost of the 146 remaining crossings of nearly $8,000,000. The proposed Pennsylvania crossings will probably cost the city a greater than the average rate, as the expense of raising the extensive track system of the railway company is relatively great. Other railway crossings would show a much smaller average cost, notably so, where the abandoning of certain street crossings will be possible. In order to obtain a proper conception of the magnitude of the work, there must be added to the city's expense that of the railway company, which by law is made nearly twice as great. Railways, when eliminating grade crossings, also frequently take the opportunity to make certain betterments, the cost of which is not shared by the city, so that it is safe to say the total sum to be expended in connection with grade elimination, based upon present conditions, will amount to over $24,000,000. The expense of establishing grade crossings must be weighed in the balance with that proposed for other improvements. It would be neither practical nor reasonable to so hasten the one improvement that others would suffer. Both the city and railway companies are limited as to the amount of work they can undertake, and as to the indebtedness they may incur. There can be no doubt, however, that progress in removing the dangerous death traps at railway crossings should be continuous, making possible thereby the conducting of a busy world without delay along paths of security and safety. There are two ideas which I would like to place before you this evening. The first has to do with the spirit with which we are to approach the great engineering problems now prominently before us. Those great social movements, which have been most successful, have had their origin in a deep seated conviction of the public need. The spirit which causes the successful citizen to leave his comfortable home, his family and friends, and go forth to battle as a soldier for his country's welfare, is a spirit that is not born of lust for gold. Such a spirit cannot be aroused by the hope of financial gain, nor by thirst for fame and glory. Yet that spirit is the one that makes and unmakes nations, one that builds and destroys cities, and if we seek the highest success in developing a city pre-emiently adapted to the well-being of its citizens, it is the spirit in which we much approach these great works which are to tax our strength, our patience, our every resource. If in tearing up the streets of our city, in obstructing the use of our most important thoroughfares and causing inconveniences and delay to thousands of our busy citizens, our first and absorbing thought is that we are saving lives and building wisely for the future safety and convenience of our people, then our task will be light and our work successful. If, on the other hand, it is to be a scramble for selfish advantage, a continued struggle to see who will profit most by the changes that must be made, then the way will be dark and long and dreary, and the final realization of our plans and hopes may be long deferred. The second idea which I would present, pertains to a study of the problem itself. In this study we should look beyond little things, taking the broadest view permitted by the possibilities of the case. With this in mind I would call attention to some failures to grapple successfully with great economic problems. that leads us to huddle together in crowds as long as, by any amount of squeezing, room can be made for one more. Everyone in New York wants to do business in the region of the City Hall. Engineering genius has pandered to their wishes and we have seen the development of the great office building. There was a time when the New York Life building was remarkable for its size and beauty. At a later date, the Park Row building enjoyed the distinction of having the greatest number of stories. Now it is the Singer building, and the limit of engineering possibilities has not been reached. Every morning and every night the people surge in and out of these great buildings in torrents. The entrance of every building is a vortex whose dangers are more real than one is apt to think. Now the lesson is this. Engineers have been providing the remedy instead of removing the cause of the difficulty. It is a case that calls for the exercise of governmental authority. People must be governed. They will grumble more or less, but in the end, when the reason for an order has been demonstrated, they do not complain. There should be a limit to the size of buildings, a restriction to conform to the reasonably practicable limits of transportation and, with a proper adjustment so made, the transportation problem would be solved. The application of this lesson to the present case lies in the continued practice of opening new grade crossings across the railways. We are planning to remedy an evil, but not to remove the cause. We should by all means eliminate the grade crossings, but where is the end to be? Cleveland, one million in 1920. Its limits will reach out towards Lorain and Willoughby and where is to be the end of our work? it must be clear that the future welfare of the people demands that there be a stop to the perpetual elimination of grade crossings. The source of the evil must be removed in order that the expensive remedy may be avoided. In bettering the conditions within the city at the present time, we must look ahead and avoid similar future expenditures, the date of which will be hastened by that great urban growth, for which we so fondly hope. We have made great improvements in the past. We have greater ones before us. The cost of these works is fabulous. We must think well and plan wisely that the wealth intrusted to our care be not frittered away in costly mistakes or careless management. 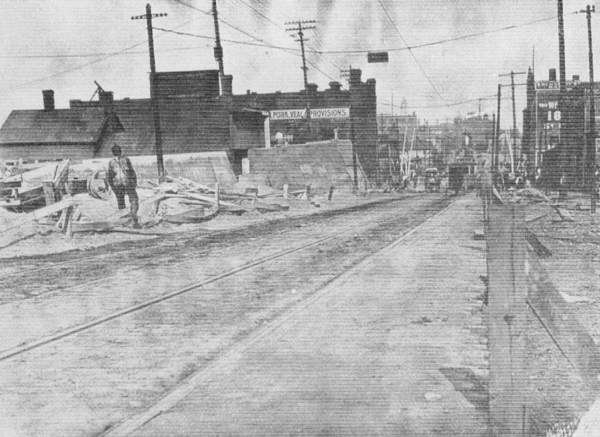 While it is apparent from Mr. Hoffmann's statement that there are only some six or eight grade crossings within the city limits which are charged against the Baltimore & Ohio Railroad Company, it is not generally known that the city has just completed the elimination of the grade crossing of Clark avenue S. W., with the new classification yards of this company, at a cost of about $215,000. In this improvement, the railroad company participate under City Ordinance No. 6424, passed March 11, 1907. 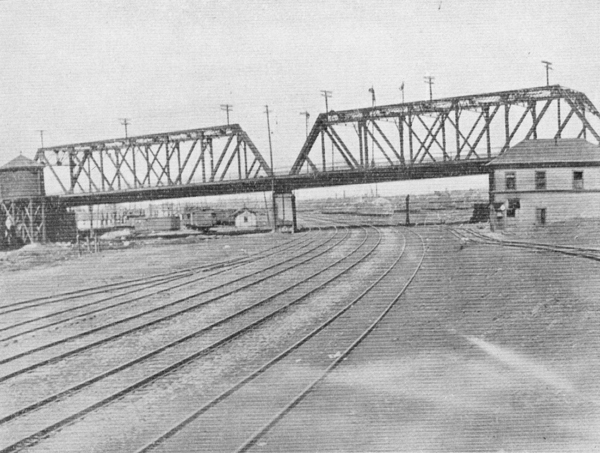 The bridge is not a high level structure, but crosses the yard tracks with a clearance of 21 feet above top of rails, and will form a link in the series of embankments and bridges which are proposed to carry this thoroughfare over the various railroads and the river to a connection with Clark avenue S. E.
The bridge was originally projected to comprise seven pony truss spans, about 100 feet in length, but plans were later changed to include an additional span over a proposed street, paralleling the right of way of this company on its south side, thus making the length of the completed structure 780 feet. At present, the bridge is connected with the grade of the flats by an approach embankment on each end and will probably carry very little traffic until the improvement is completed across the valley. Every president, general manager and superintendent of a railroad, yes, even the engine men and the section men would be only too happy to have all grade crossings on the line eliminated. The clash between the municipal authorities and the railroad management, over the elimination of grade crossings, is not due to any difference of opinion as to the desirability of such, elimination, but to a question of method and finance. many cities and towns, must consider the demands of any municipality not as an isolated case, but as one of the many cases existing along its line. The municipal authorities seldom look beyond their corporate limits and fail to appreciate that other towns and cities are making similar demands and to grant them all is beyond the financial ability of any railroad. The railroads are willing and do eliminate many grade crossings of their own volition, whenever they can do so without extraordinary expense. The state of Iowa has no legislation on the subject, nor does there seem to be any demand for any action; yet, up to June 30, 1908, the railroads had eliminated 751 grade crossings. Some of the states are regulating the matter by legislative enactment. In Vermont, each railroad is required to eliminate one grade crossing each year for every 80 miles of road. In Connecticut, it is one grade crossing each year for each 60 miles of road. In Massachusetts and Virginia, a state commission orders what grade crossings shall be eliminated and also approves the method by which it shall be done. Not all grade crossings are, by any means, the voluntary creation of the railroads. The locating engineer reaches a town with the survey and all the male inhabitants thereof come out to meet him and show him where to locate the line. In all probability, they have offered free right of way to the railroad as an inducement to run through their town and not through some rival place. So, to please the people and to get through the town with as little friction as possible, the engineer locates the line as the people desire, which, in many cases, is down some back street, which helps the town in the cost of the right of way. The street is duly vacated for that purpose by a unanimous vote of the city fathers and with the consent and approval of everybody. The town having railroad facilities, grows, develops and expands. The early citizens pass away and a new generation coming on suddenly jumps up and asks the railroad what it is doing there, occupying a street, invading the people's rights, and demand forthwith track elevation and grade crossing elimination and all at the expense of the offending (?) road. Some twenty odd years ago, a town, in the southwest, was laid out just as the railroad was being completed. They made Main street 100 feet wide, but placed 50 feet of its width on the north side of the right of way and 50 feet on the south side, and North and South Main street has become the big business street. The town has now some 12,000 inhabitants and already they are beginning to inquire why the railroad is occupying the center of their magnificent main thoroughfare. pay all the cost of such change even though the condition is the result of the expressed wish of the citizens. There is nearly always a needless amount of friction as to what methods shall be followed in eliminating a grade crossing; not generally between the engineer of the municipality and the engineers of the railroads, but it comes from those who are not engineers and who do not understand the details of the problem. The methods to be employed in each case should be treated purely and simply as an engineering problem. If the decision of the Massachusetts State Commission in the matter of grade crossing elimination at New Bedford were made the basis of all negotiations, it would be much better for all concerned. 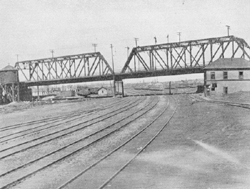 In that case the commission insisted that the cost be kept down to the lowest figures compatible with standard railroad practice and a fair substitution for what both the railroad and the city then enjoyed, and decreed, that the railroad should be elevated and pass over the streets on structures which shall be proportioned and constructed in accordance with the general specifications of the railroad company for railroad bridges. The greatest objections to plans proposed by the railroad come from those who, after an examination of the plans, still have no conception of exactly what they mean. I was called upon to examine and report on an undergrade crossing on a country road, where the railroad company's plans showed an undercrossing giving 20 feet clear width and 12 � feet clear height for the highway. The citizens on looking at the plans declared they could not drive through such a small opening; it was an impossibility--yet, only 1,000 feet distant, on the same highway, there was a wagon bridge, 80 feet long, with only 14 feet clear width and 11 feet clear height, through which they had been driving for over 20 years. At another time I prepared a plan, which called for supports at the curb line of the street. There was a vigorous protest; the railroad wanted to blockade the street; business could not be done on account of those supports. 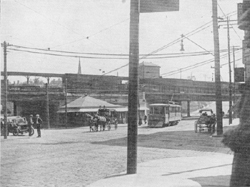 In a cursory examination of the streets of that city, there was found to be at the curb line, or within 2 � feet of it, the following: Trolley poles, telegraph poles, telephone poles, electric light poles, fire alarm poles, flag poles and barber poles, besides hydrants, street lamps, awning supports, mail boxes, waste paper boxes, police call boxes, street signs, business signs, hitching posts, horse blocks and shade trees. My experience is that the smaller the town, the greater the objection to supports at the curb line. New York has supports at the curb line. In Chicago you find supports at the curb line and also in center of the street. In Philadelphia all crossings on the Philadelphia & Reading Railroad, 32 in all, covering some five miles of track elevation, have posts at the curb line and many have also a support in the center of the street. Not all objections to a railroad company's plans are honest; entirely too much opposition is for political effect. A county commissioner objected to a 4 per cent grade in a subway, when the average traffic was only 15 teams per day, saying it was an outrage to require the farmer to haul over such a grade, and yet there was an 8 per cent grade in that same highway, not 3,000 feet away, and they were at that time expending the taxpayers' money in building a road with 15 per cent grade. On another occasion, the engineer of a new line presented plans to the county commissioners to eliminate some ten or more highway crossings. Action on them was delayed on one pretext, and another, until the engineer inquired of one of the commissioners how soon any action would be taken. In reply, the commissioner said he did not really know, the plans looked all right and, no doubt, if it was properly appreciated, they would all be approved. At the same time the newspapers published an article saying that the railroad's plans had not been allowed, because the board had the interests of the people at heart, and that they could be relied upon to see that the rights of the county were upheld. I am glad to be able to say that those plans were finally approved, without being "appreciated." Many plans are criticized and objected to, because they are not considered beautiful or artistic. I think many such objections are not well founded, but are based on wrong ideas as to what is truly beautiful and artistic. It must be remembered that, in by far the greater number of cases, artistic design is greatly hindered by location and legal requirements, and that the beauty of proportion is not attainable, while the structural forms of material with which the engineer has to work in bridge building, are not so elastic and manageable as to lend themselves readily to artistic design. It might be well to recall a few of the laws and maxims given out on the subject of design. "When the simple form and purpose of a structure becomes so disguised that the mind cannot grasp them, then the effect will be to create dissatisfaction, which is contrary to all ideas of beauty." "The general form should never disguise the purpose of the structure, but should aid in impressing the mind with visible strength and proper adaptation to the purpose." "Ornamentation should not change the general character of the structure to such an extent as to hide the underlying principles of construction." This law is so frequently violated that we are often at a loss whether or not to believe what we see. "In any design any violation of engineering principles is also a violation of good taste from an artistic point of view." "A form which admits of no explanation or which is a mere caprice cannot be beautiful." Covering frames with concrete or boards painted to imitate stone arches, or horizontal girders blended with arch construction, all violate the foregoing laws. The last instance is like putting the dome of a Turkish Mosque on a Gothic Cathedral. The character of any structure must not be contradicted by any of its parts. Finally, technical miracles have no claim to beauty. B. R. Leffler also took part in the discussion, bearing principally on the grade crossing along the L. S. & M. S. Ry., with which he is actively connected. This electronic, World Wide Web edition of the "Railway Grade Crossing Elimination in Cleveland," by Robert Hoffmann, contains the complete text as found in the reprint of the original The Journal of the Cleveland Engineering Society article from 1910. The site is hosted by the Cleveland State University Library and was prepared by civil engineering graduate student Callie Voiklis.